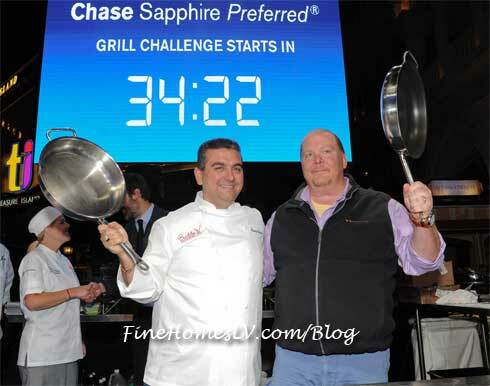 $20,000 first place was up for grabs at the second annual Chase Sapphire Preferred Grill Challenge during the Vegas Uncork’d by Bon Appétit Night Market: East Meets West Thursday, May 8, 2014. Celebrity chef Mario Batali and TLC’s Cake Boss Buddy Valastro partnered with two students from Le Cordon Bleu College of Culinary Arts in Las Vegas, Brooke Worley and Kelly Ricker, for the ultimate live grilling competition. A Prosecco saber off started with cheers the eighth annual Vegas Uncork’d by Bon Appétit and threw the destination into a flurry and fine wine and foie gras as world-renowned chefs descend upon Las Vegas this weekend. Now in its eighth year, the foodie festival continues to gain momentum with tickets selling faster than ever before. A team of acclaimed chefs from Japan, China, Singapore and Australia are teaming up with American culinary luminaries Mario Batali, Daniel Boulud, Thomas Keller, and Buddy Valastro to create THE NIGHT MARKET: EAST MEETS WEST, an authentic Asian-inspired outdoor food and beverage festival. The delectable night of food, fun and entertainment, part of Vegas Uncork’d by Bon Appétit, will be held in the Doge’s Palace plaza of The Venetian Las Vegas May 8 from 8-11 p.m.